Scoring well on the mathematics section of the SAT exam isn't guaranteed by getting good grades in Algebra and Geometry. Turn to SAT Math For Dummies for expert advice on translating your classroom success into top scores. Loaded with test-taking strategies, two practice tests, and hundreds of problems with detailed solutions and explanations, SAT Math For Dummies helps you maximize your scores in no time. SAT Math For Dummies gives you expert tips on how to make the best use of the limited time allowed and get your best possible score! Mark Zegarelli holds degrees in math and English from Rutgers University. He is a math tutor and writer with over 25 years of professional experience. Zegarellli has written numerous Dummies books, including LSAT Logic Games For Dummies and Basic Math & Pre-Algebra Workbook For Dummies. Part I: Making Plans for This SATurday: An Overview of SAT Math. 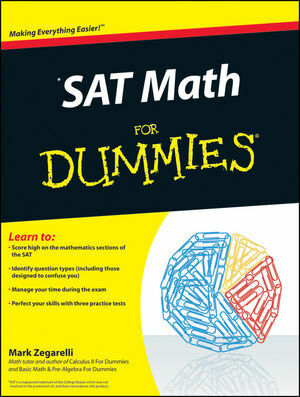 Chapter 1: SAT Math Basics. Chapter 2: Testing 1-2-3: SAT Math Test-Taking Skills. Part II: Did They Really Cover This Stuff in School? A Review of Math Skills. Chapter 3: The Numbers Game: Arithmetic Review. Chapter 4: Return of the X-Men: Reviewing Algebra. Chapter 5: Picture Perfect: Reviewing Geometry. Chapter 6: Functions and Coordinate Geometry. Chapter 7: From the Grab Bag: A Variety of Other SAT Math Skills. Part III: Your Problems Are Solved! SAT Problem-Solving Techniques. Chapter 8: What’s in a Word? SAT Word Problems. Chapter 9: SAT Math Strategy. Part IV: Practice Makes Perfect: SAT Math Practice Tests. Chapter 10: Practice Test 1. Chapter 11: Answers and Explanations for Practice Test 1. Chapter 12: Practice Test 2. Chapter 13: Answers and Explanations for Practice Test 2. Chapter 14: Practice Test 3. Chapter 15: Answers and Explanations to Practice Test 3. Chapter 16: Ten Tips to Improve Your SAT Math Score. Chapter 17: Ten Tips to Be at Your Best on the SAT.